These are the results of the latest poll conducted by the Palestinian Center for Policy and Survey Research (PSR) in the West Bank and the Gaza Strip between 14-17 March 2018. The poll was conducted after the explosion of a roadside bomb that targeted the convoy of Palestinian Prime Minister Rami al Hamdallah during his visit to the Gaza Strip and amid mutual accusations between Fatah and Hamas regarding the responsibility for the stalemate in reconciliation and the Gaza explosion. The period before the conduct of the poll witnessed also the publication of leaks concerning alleged substance of the American “Deal of the Century.” Several other developments may have influenced the findings of the poll: reports were published regarding an eavesdropping by PA security services on citizens’ phone calls; public participation in non-violent protests diminished considerably; talks emerged around possible participation of East Jerusalemites in Jerusalem’s municipal elections; and warnings were issued by international agencies concerning the worsening living and humanitarian conditions in the Gaza Strip. This press release addresses these issues and covers other matters such as general conditions in the Palestinian territories and various aspects of the peace process. Total size of the sample is 1200 adults interviewed face to face in 120 randomly selected locations. Margin of error is 3%. In the first quarter of 2018, PSR’s poll explored various issues and public concerns: (1) the American role in the peace process and reports concerning the “deal of the century,” (2) the Gaza explosion which targeted the Prime Minister’s convey, (3) the great decline in popular participation in non-violent confrontations, (4) the possible participation of East Jerusalemites in Jerusalem’s municipal elections, and (5) other internal matters such as the worsening living and humanitarian conditions in the Gaza Strip, eavesdropping on phone calls of Palestinian citizens, the status of Palestinian democracy and human rights, reconciliation, and the internal balance of power. Findings show that the overwhelming majority of Palestinians views the American role in the peace process as biased in favor of Israel and refuses the purported American ideas that have been reportedly included in the American “deal of the century,” such as making Abu Dis a capital of the Palestinian state or expanding the southern borders of the Gaza Strip into Sinai. The majority views the American suspension of support for UNRWA as aiming at closing the refugees’ file and deny them their right of return. A large percentage worries that this American position might weaken the ability of the Palestinian side to defend the rights of the refugees. For all of this, about two-thirds are opposed to the renewal of contacts between the PA and the US or the resumption of Palestinian-Israeli negotiations. Despite the fact that a large percentage supports the peace process, more than 90% expect to see no peace between Palestine and Israel in the next five, ten, or even 100 years. The largest percentage views the medium and long term future with a great deal of trepidation, pessimism and frustration. Findings show that about half of the public believes that Israel stands behind the explosion that targeted the convoy of the Palestinian Prime Minister during his visit to the Gaza Strip. About three quarters of the public think that the aim of the explosion was to foil reconciliation efforts. 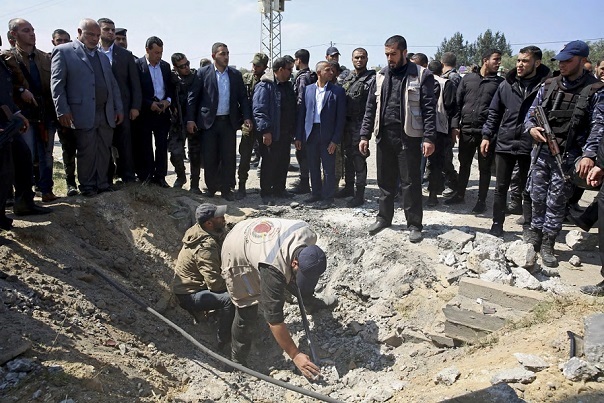 About a quarter of Gazans however believe that the explosion represented a protest against the policies of the PA government toward the Gaza Strip. Despite great public support for non-violent protests and the great admiration the public has for the Palestinian youth, Ahd Tamimi, viewing her as a role model and a symbol of popular resistance, the largest percentage attributes the significant decrease in public participation in non-violent protests to a weak public confidence in the Palestinian leadership and factions. Many also believe that the public thinks that such protests are ineffective in the confrontation with Israel. Indeed, findings of the poll show that about half of the public is in favor of a return to an armed intifada. Findings also show that despite concerns about being seen as an acceptance of the Israeli annexation of East Jerusalem, a majority of the public favors the participation of East Jerusalemites in the next Jerusalem municipal elections. Participation in the vote is seen as giving East Jerusalemites the ability to influence the municipal policies that affect them. Among all Palestinians, but more significantly among East Jerusalemites, less than a third are opposed to such participation. Almost all Palestinians view conditions in the Gaza Strip as dire, bad or very bad. Responsibility for this situation is placed first on Israel, then the PA, and finally Hamas. But for Gazans, the blame is placed first on the PA, with Israel and Hamas second and third respectively. About two-thirds think that the PA security services do indeed eavesdrop on phone calls of citizens and officials and more than 60% believe that such eavesdropping is done illegally and without any just cause. A majority believes that such behavior benefits the occupation first and foremost and that the Palestinian judiciary is incapable of putting an end to it. Those who positively view Palestinian democracy, seeing it as good or very good, are less than a quarter while about two-thirds believe that Palestinians in the West Bank and the Gaza Strip cannot criticize the PA without fear. Optimism about the success of reconciliation plummets to less than a third; satisfaction with the performance of the reconciliation government does not exceed one third; and about half of the public puts the blame for the poor showing of the reconciliation government on the PA and the PA leadership while a small minority puts the blame on Hamas. Finally, the domestic balance of power remains relatively unchanged compared to three months ago: more than two-thirds demand the resignation of president Abbas; a Hamas candidate wins against Abbas in presidential elections; but Fatah enjoys more popular support than Hamas, with a five point difference in its favor. Level of satisfaction with the performance of president Abbas stands at 33% and dissatisfaction at 63%. Level of satisfaction with Abbas stands at 40% in the West Bank and 20% in the Gaza Strip. Three months ago, satisfaction with Abbas stood at 31% (36% in the West Bank and 22% in the Gaza Strip). 68% of the public want president Abbas to resign while 27% want him to remain in office. Three months ago, 70% said they want Abbas to resign. Demand for Abbas’ resignation stands at 62% in the West Bank and 81% in the Gaza Strip. Three months ago, demand for Abbas resignation stood at 64% in the West Bank and 80% in the Gaza Strip. If president Abbas does not nominate himself in a new election, 29% prefer to see Marwan Barghouti replacing him, while 19% prefer Ismail Haniyeh; Mohammad Dahlan 8% (2% in the West Bank and 20% in the Gaza Strip), Rami al Hamdallah (7%), Mustafa Barghouti (4%); Khalid Mishal (3%), and Salam Fayyad (2%). If new presidential elections were held today and only two were nominated, Ismail Haniyeh and Mahmoud Abbas, the former would receive 52% and the latter 41% of the vote (compared to 53% for Haniyeh and 41% for Abbas three months ago). In the Gaza Strip, Abbas receives 35% of the vote (compared to 33% three months ago) and Haniyeh receives 62% (compared to 66% three months ago). In the West Bank, Abbas receives 45% (compared to 47% three months ago) and Haniyeh 45% (compared to 43% three months ago). If the competition was between President Abbas from Fatah and Mustafa Barghouti from al Mubadara (Initiative), Abbas receives 48% and Mustafa Barghouti receives 43% of the vote. If presidential elections were between three: Mahmud Abbas, Marwan Barghouti and Ismail Haniyeh, Abbas would receive 22%, Barghouti 38% and Haniyeh 37%. If presidential elections were between two: Marwan Barghouti and Ismail Haniyeh, Barghouti receives 55% and Haniyeh 39%. If new legislative elections were held today with the participation of all factions, 61% say they would participate in such elections. Of those who would participate, 31% say they would vote for Hamas and 36% say they would vote for Fatah, 9% would vote for all other third parties combined, and 25% are undecided. Three months ago, vote for Hamas stood at 30% and Fatah at 36%. Vote for Hamas in the Gaza Strip stands today at 32% (compared to 36% three months ago) and for Fatah at 32% (compared to 30% three months ago). In the West Bank, vote for Hamas stands at 30% (compared to 26% three months ago) and Fatah at 38% (compared to 41% three months ago). Only 33% of the Palestinian public say people in the West Bank can criticize the PA without fear; 63% of the public say that people cannot criticize the PA without fear. In a question about the status of democracy in Palestine and other countries, only 23% say Palestinian democracy is good or very good while only 10% say democracy in Egypt is good or very good. By contrast, 64% say democracy in Turkey is good or very good; 57% say democracy in Israel is good or very good, and 55% say democracy in France is good or very good. Positive evaluation of conditions in the Gaza Strip stands at 5% and positive evaluation of conditions in the West Bank stands at 20%. In an open-ended question, we asked respondents to identify the party or side responsible for the worsening of conditions in the Gaza Strip: the largest percentage (39%) blames Israel; 25% blame the PA, president Abbas, the reconciliation government, or Fatah; and 18% blame Hamas. Responses of West Bankers differ from those of Gazans: 43% of West Bankers compared to only 30% of Gazans blame Israel; and 16% of West Bankers compared to 43% of Gazans blame the PA, Abbas, the reconciliation government, and Fatah. However, responses of West Bankers and Gazans are almost identical regarding Hamas’ responsibility: 19% of West Bankers and 18% of Gazans blame Hamas. The belief that the PA and its various constituents are responsible is higher in refugee camps and cities (30% and 27% respectively) compared to villages/towns (18%), among the religious (33%) compared to the somewhat religious and the non-religious (19% and 23% respectively), among those who oppose the peace process (41%) compared to those who support the peace process (18%), among supporters of Hamas and third parties (51% and 34% respectively) compared to supporters of Fatah (7%), among those with the lowest income (36%) compared to those with the highest income (18%), in the governorates of Khanyounis and Rafah (50% each) compared to the governorates of Jenin, Tulkarm, and Jericho (4%, 8%, and 8% respectively), and among the holders of BA degree (29%) compared to illiterates (21%). Perception of safety and security in the Gaza Strip stands at 54%. In the West Bank perception of safety and security stands at 53%. Three months ago, perception of safety and security in the Gaza Strip stood at 53% and in the West Bank at 45%. Findings show that the percentage of Gazans who say they seek to immigrate to other countries stands at 45%; in the West Bank, the percentage stands at 19%. Three months ago, 41% of Gazans and 22% of West Bankers indicated that they seek to immigrate. Perception of corruption in PA institutions stands at 78% and a majority of 52% views the PA as a burden on the Palestinian people while 41% view it as an asset for the Palestinian people. 62% say they believe that the reports are accurate and 29% believe they are inaccurate. 62% do not think, and 26% think, that the eavesdropping on phones was legal or for legitimate purposes. 56% think the primary beneficiary of eavesdropping conducted by the Palestinian security services is the Israel occupation while 25% think it is the PA administration and leadership, and only 12% think it is the Palestinian citizen and his or her security. The percentage of those who believe that occupation is the primary beneficiary increases in the West Bank (58%) compared to the Gaza Strip (51%), among the religious (57%) compared to the non-religious (49%), among those opposed to the peace process (61%) compared to supporters of the peace process (54%), among the youngest, 18-22 years (60%) compared to those whose age is between 40 and 49 years (52%), among supporters of third parties and Hamas (60% and 58% respectively) compared to supporters of Fatah (46%), among farmers, retirees, and students (81%, 66%, and 59% respectively) compared to laborers (49%), among private sector workers (55%) compared to those who work in the public sector (43%), and among the illiterates (60%) compared to holders of BA degree (54%). Moreover, a majority of 53% think that if a Palestinian citizen (or even a former head of a Palestinian security service) submits a complaint to the Palestinian judiciary, it would be incapable of putting an end to this eavesdropping. Only 37% believe that the judiciary is capable of ending the eavesdropping. We asked the public about its viewership habits in the last two months. Findings indicate that Al Jazeera TV viewership remains the highest, standing at 19%, followed by Maan TV (15%), Palestine TV and Filasteen al Youm/Palestine Today (13% each), al Aqsa TV (12%), Al Arabiya, al Mayadeen, and al Quds TV (5% each). We asked the public about the rates for 3G service, a newly introduced service by Palestinian providers in the West Bank that allows for faster access to the internet on mobile phones: a majority of West Bankers (57%) describes the rates as high or very high and only 3% describe them as low. 11% think the rates are reasonable or medium. 30% did not know much about the service or the rates. Two-thirds believe that the primary motivation behind giving to the poor is to win God’s satisfaction while less than a quarter (23%) think that people give to the poor in order to win the satisfaction of other people. Three quarters of the respondents say that they give to the poor and 23% say they do not. When asked in an open-ended question about its own motivation for giving, an overwhelming majority (80%) says that it is driven by religious incentive (such winning God’s satisfaction) while 20% say that it is driven by humanistic or social incentives (such as to ease the burden on or help the poor). Now that it has taken control of the border crossings and the headquarters of the ministries and other public agencies, 26% are satisfied and 65% are dissatisfied with the performance of the reconciliation government. Three months ago, satisfaction stood at 38%. Similarly, only 30%, compared to 50% three months ago, are optimistic and 64% are pessimistic about the success of reconciliation. The largest percentage (45%) believes that the PA, president Abbas, and the prime minister are responsible for the poor showing of the reconciliation government. By contrast, only 15% believe that Hamas is responsible for that poor showing; 13% say the government is doing a good job; and 27% do not who is to blame. It is worth noting that the responses of West Bankers are greatly different from those of Gazans: while about one third (32%) of West Bankers blames the PA, Abbas and the prime minister, 69% of Gazans puts the blame on these three. By contrast, only 12% of West Bankers, compared to 21% of Gazans, blame Hamas. We also asked the public about two claims: the one made by the reconciliation government that Hamas is preventing it from assuming control over the Gaza Strip, particularly in financial and security matters, and the claim made by Hamas that the reconciliation government is failing to carry out its responsibilities and duties in the Strip and that it continues to impose sanction on Gazans. About a third (32%) believes the two claims are baseless while 14% think the two claims are accurate. By contrast, 23% believe Hamas’ claim to be accurate and only 14% believe that the claim of the reconciliation government is accurate. In this context, 37% (60% in the Gaza Strip and 26% in the West Bank) support the Dahlan-Hamas efforts to reach an agreement on creating a joint administration for the Gaza Strip while 45% (36% in the Gaza Strip and 50% in the West Bank) are opposed to such efforts. In an open question, we asked the public about its estimate of the party behind the explosion: the largest percentage (45%) believes it is the occupation; 14% believe it is Hamas and an identical percentage believes it is the PA or one of its agencies; 2% think it is Fatah, 1% think it is Dahlan, and 3% think it is one of the extremist groups. About three quarters (74%) believe that the aim of the perpetrators is to foil the reconciliation efforts while 17% (23% in the Gaza Strip and 14% in the West Bank) believe that the aim is to protest against the policies of the reconciliation government toward the Gaza Strip. 48% support the two-state solution and 50% oppose it. Moreover, 46% believe that a Palestinian majority supports the two-state solution and 47% say a majority is opposed to it. Similarly, 50% believe that a majority of Israelis are opposed to the two-state solution and 41% think an Israeli majority supports that solution. 57% say that the two-state solution is no longer practical or feasible due to settlement expansion while only 40% think that it remains feasible because settlements can be evacuated. Similarly, 73% believe that the chances for establishing an independent Palestinian state next to the state of Israel during the next five years are slim or nonexistent while 25% think the chances are high or medium. Despite the above, only 28% support a one-state solution in which Palestinians and Israelis have equal rights and 69% are opposed. When given three options to choose from, the largest percentage (35%) chose armed resistance as the most effective means of establishing a Palestinian state next to the state of Israel while 31% chose negotiation and 25% chose non-violent resistance effective. Three months ago, 44% indicated that armed resistance is the answer and 27% sided with negotiation. When the public is asked if it supports each of the following the responses were different: 74% support joining more international organizations; 63% support popular non-violence; 48% support a return to an armed intifada; and 49% support dissolving the PA. Support for a return to an armed intifada is higher in the Gaza Strip (67%) compared to the West Bank (39%), in cities and refugee camps (51% and 49% respectively) compared to villages/towns (34%), among the religious (55%) compared to the somewhat religious and the non-religious (43% each), among those who are opposed to the peace process (74%) compared to supporters of the peace process (34%), among men (52%) compared to women (45%), among those whose age is between 18 and 22 (58%) compared to those whose age is 50 years or above (48%), among Hamas supporters (74%) compared to supports of Fatah and third parties (36% and 42% respectively), among students (70%) compared to housewives and laborers (43% and 45% respectively), and among holders of BA degree (54%) compared to holder of elementary education and the illiterates (35% and 48% respectively). We asked the public about its view on why popular participation in non-violent protests, particularly those related to the American recognition of Jerusalem as Israel’s capital, has been waning: 39% say it is due to lack of trust between the public on the one hand and the PA leadership and factions on the other; 27% say it is due to the fact that non-violence is ineffective; and 25% say that it is due to the fact that many people think that the responsibility for confronting Israel and the US falls on the shoulders of the PA. 92% indicate that they have heard, and 8% have not heard, of Ahd Tamimi, a Palestinian youth activist being tried by the Israeli occupation on charges that she slapped an Israeli soldier. Among those who have heard about her, 64% say that they want her to be a role model for them and their relatives. The percentage of those who consider Tamimi a role model is higher in the Gaza Strip (80%) and lower in the West Bank (56%). It is also higher in refugee camps and cities (68% and 65% respectively) compared to villages/towns (56%), among the religious and the somewhat religious (66% and 62% respectively) compared to non-religious (54%), among those who are opposed to the peace process (72%) compared to those who support the peace process (60%), among supporters of Fatah and Hamas (71% each) compared to supporters of third parties (48%), and among the refugees (71%) compared to the non-refugees (58%). 60% believe that Israel’s long-term aspiration is to expand the state of Israel to stretch from the Jordan River to the Mediterranean Sea and to expel the Palestinian population, and 23% think that Israel aims at annexing the occupied territories and deny the Palestinian citizens their rights. By contrast, only 16% think that Israel’s long-term aspiration is to insure its security and then withdraw from all or parts of the occupied territories. Similarly, 77% say that they are worried that they would be hurt on their daily life by Israelis or that their land would be confiscated or homes demolished; 22% are not worried. A majority of 52% indicates that it supports the resolutions made by the recent meeting of the PLO’s Central Council, such as the cancellation of the recognition of Israel, the suspension of the Oslo Agreement, and others, while 18% indicate that they agree with some but not all of them, and 24% oppose them. Nonetheless, about two-thirds (65%) believe that president Abbas will not implement these decisions and only 24% believe he will implement them. The belief that president Abbas will not implement the Council’s decisions is higher in the Gaza Strip (70%) compared to the West Bank (62%), in cities (66%) compared to refugee camps and villages/towns (60% and 62% respectively), among the religious (66%) compared to the non-religious (47%), among those opposed to the peace process (82%) compared to supporters of the peace process (54%), among men (67%) compared to women (62%), among supporters of Hamas and third parties (80% and 65% respectively) compared to supporters of Fatah (43%), and among those who work in the private sector (70%) compared to those who work in the public sector (59%). Moreover, 74% say the Arab World is too preoccupied with its own concerns, internal conflicts, and the conflict with Iran and that Palestine is no longer the Arab’s principal or primary issue or cause. Only 24% think Palestine remains the Arab’s principle cause. In fact, 70% believe that there is already an Arab Sunni alliance with Israel against Iran despite the continued Israeli occupation of Arab land while 20% believe that the Arabs would not ally themselves with Israel until it ends its occupation and allows the creation of a Palestinian state. 46% of all the Palestinian public support the participation of East Jerusalemites in the next Israeli municipal elections by nomination and voting while 15% support only voting, and 29% say that they are opposed to all kinds of participation. Support for participation, either by nomination or voting, declines to 42% among East Jerusalemites but the opposition to participation among them remains almost identical (30%) to that of the general population. It is worth noting however that a large percentage (28%) did not express any views on the matter, probably out of concern that it might be risky to state its views on the subject or that its answer might not be a popular one. 25% believe that after 10 years conditions, or the status quo, will be as they are now with occupation and settlement expansion continuing with little change; 34% say settlements will expand and there will be one political entity characterized by a system of apartheid that discriminates against the Palestinians; 24% believe that there will be a war or an armed intifada that will end the occupation. Only 9% believe that there will be peace between Israel and the Palestinians and a Palestinian state will be established. After 100 years, only 12% believe that things will be as they are now with occupation and settlement expansion continuing; 30% think settlements will expand and there will be one apartheid state that discriminates against the Palestinians; 29% think there will be a war or an intifada that will end the occupation. The belief that there will be peace between Israel and a Palestinian state remains unchanged at 9%. 65% are opposed to the resumption of contacts with the American administration that have been suspended last December after the US recognition of Jerusalem as the capital of Israel; 21% favor a resumption of contacts. Similarly, 68% say that the PA leadership should not return to negotiations with Israel if the US administration asks it to do so while 27% say it should comply with the US request. If negotiations with Israel resume under US sponsorship, the US will be biased in favor of Israel in the eyes of 88% of the Palestinians while only 7% think the US will be an honest broker and 2% think it will be biased in favor of the Palestinians. A slim majority of 51% says that if the US submits its peace plan, the so-called “deal of the century,” the PA leadership should reject it regardless of its content because it must be bad for Palestinians while 29% say that the leadership should accept or reject the plan only after reviewing and discussing its content. Only 11% say that the Palestinian leadership should accept the “deal of the century.” The percentage of those who want the PA to reject the US plan regardless of its content is higher in cities (53%) compared to villages/towns (41%), among the religious (55%) compared to the non-religious and the somewhat religious (36% and 49% respectively), among those opposed to the peace process (62%) compared to supporters of the peace process (46%), among men (55%) compared to women (48%), among Hamas supporters (62%) compared to supporters of third parties and Fatah (44% and 47% respectively), among those who work in the private sector (52%) compared to those who work in the public sector (41%), and among the illiterates (58%) compared to holders of BA degree (49%). A majority of 52% believes that the US administration has suspended its support for UNRWA because it seeks to close the file of the refugees and deny them their right of return while 43% think the US did that in order to pressure President Abbas to force him to return to negotiations with the US over the “deal of the century.” Moreover, 49% think that the suspension of US support for UNRWA will not weaken the Palestinian negotiating position regarding the rights of the refugees but 45% think it will indeed weaken it. On Jerusalem, 94% say they are opposed to making Abu Dis a capital of the Palestinian state; 4% support the idea. 86% are opposed and 10% support the idea of expanding the Gaza Strip to include parts of Sinai in return for an Israeli annexation of parts of the West Bank. 63% oppose and 31% support the idea of allowing Israeli Jews to live in the Palestinian state as citizens or residents while respecting the Palestinian law and enjoying the same rights and duties as the Palestinians. Support for the idea is higher in the West Bank (32%) compared to the Gaz Strip (28%), in refugee camps (39%) compared to cities and villages/towns (29% and 33% respectively), among the non-religious (46%) compared to the religious (26%), among supporters of the peace process (37%) compared to those opposed to the peace process (21%), among men (36%) compared to women (26%), among Fatah supporters (44%) compared to supporters of third parties and Hamas (16% and 17% respectively), and among those who work in the public sector (38%) compared to those who work in the private sector (32%). 45% believe that the first most vital Palestinian goal should be to end Israeli occupation in the areas occupied in 1967 and build a Palestinian state in the West Bank and the Gaza Strip with East Jerusalem as its capital. By contrast, 30% believe the first most vital goal should be to obtain the right of return of refugees to their 1948 towns and villages, 15% believe that it should be to build a pious or moral individual and a religious society, one that applies all Islamic teachings, and 10% believe that the first and most vital goal should be to establish a democratic political system that respects freedoms and rights of Palestinians. The most serious problem confronting Palestinian society today in the eyes of 28% of the public is the continuation of occupation and settlement activities while 25% say it is poverty and unemployment; 22% say it is the siege of the Gaza Strip and the closure of its crossings; 20% say it is the spread of corruption in public institutions; and 4% say it is the absence of national unity.